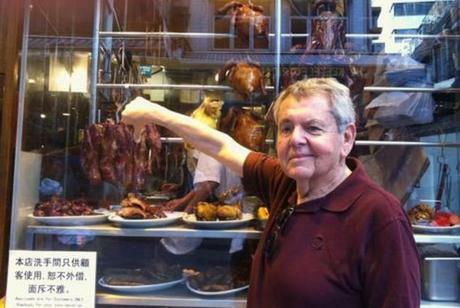 The author’s father pointing to treyfe meats. I grew up in the Brady Bunch generation, or at least the generation that grew up watching the Brady Bunch in syndication. I can still hear Peter Brady intone “pork chops and applesauce” in his best Humphrey Bogart impersonation. This phrase stuck with me long after the great Cohen bacon debate first began. I had never eaten pork chops and, quite frankly, I always hated applesauce, even the fresh applesauce that my mom made after our annual family apple-picking outings. And while applesauce was aplenty, it was always made very clear in the Cohen household that pork chops were forbidden. My dad was equally decisive when it came to other treyfemeats. Ham was definitely disgusting and catfish entirely unheard of. Yet there was somehow never a conflict with my father’s Conservative Jewish identity and his bacon-loving. Bacon was an entirely different story. “There is nothing like the smell of sizzling bacon,” my father would announce as he fried it up (in a separate bacon pan of course). We even had our favorite bacon destination, a diner equidistant from my home and the Schwartz’s (our cousins), where bacon was piled extra high and infused into nearly every dish. For an extra two dollars, the diner would serve a huge plate of sizzling bacon that was capable of clogging the arteries of most of Jewish New Jersey. I put my bacon eating days to rest long ago. I became a vegetarian at around the age of 13. Refusing roasted chicken on Shabbat was seemingly the ultimate rebellion in my home. Once when I came home early from a friend’s home, my parents asked why I hadn’t stayed. I said to my parents, “I wasn’t going to eat their pork chops and applesauce,” merely speaking symbolically, trying to reiterate that I was a vegetarian and not judging my friend by her family’s choices of meat. Until that day I didn’t even realize that pork chops and applesauce was even a real dish, thinking it as more in the vein of the chimerical green eggs and ham. “You gorge on bacon!” I responded, for some reason feeling the need to defend my carnivorous friends. “It’s exactly the same thing,” I yelled enraged at this blatant hypocrisy. This was not the first time (nor the last) we had this argument as the great Cohen bacon debate continues to this day (though never in front of my kosher children as they would never be able to reconcile me today with the sizzling bacon of my youth). And yes, my father still insists there is an inherent difference between bacon and pork chops; the former somehow implicitly acceptable and the latter clearly simply unheard of for Jews. Disclaimer: My father, despite his continued stance in the debate, has asked me to include a disclaimer that he has not had bacon in six years (though I suspect it is a cholesterol thing). I think he also just disclaimed me as well as this story in its entirety. Erica Lyons is the editor-in-chief of Asian Jewish Life – a journal of spirit, society and culture.